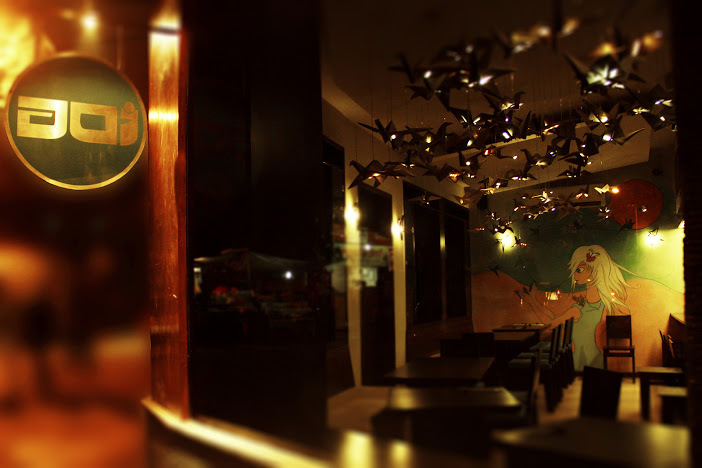 A drive through the by lanes of Andheri west had us at BOVEDA the latest eatery on this side of town. A warm staff greeted us as we entered a rather spacious restaurant and bar. 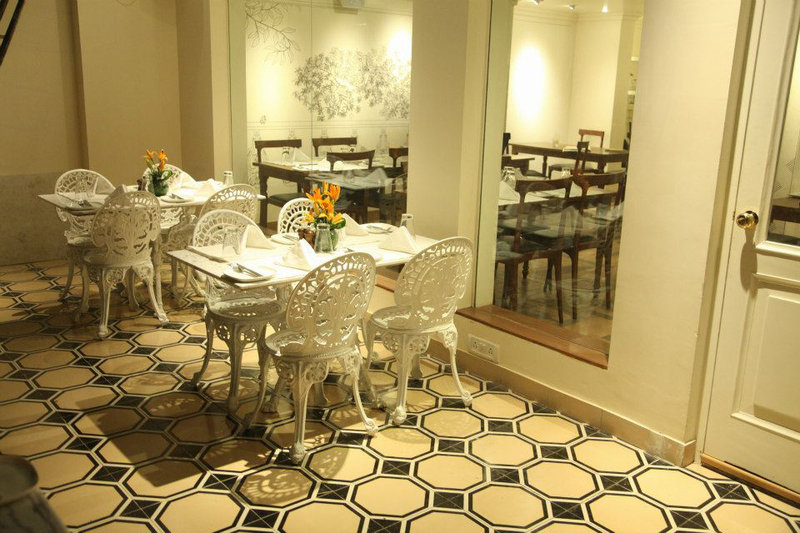 Spread Across 2,200 sq feet with a seating capacity of about 120 people, Bóveda is a Spanish word translated as vault. 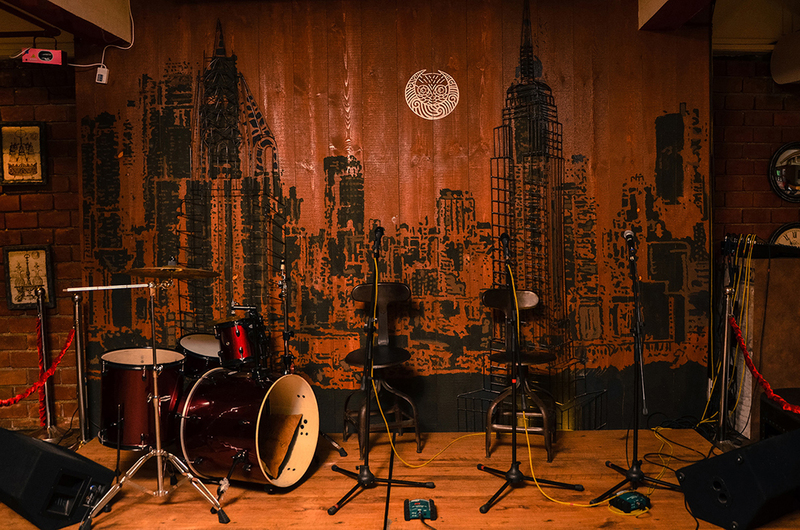 The interiors, conceptualized and managed by Sandeep Parwal & his team of MAX Solution is inspired from the design concept “Listen to the heart”. 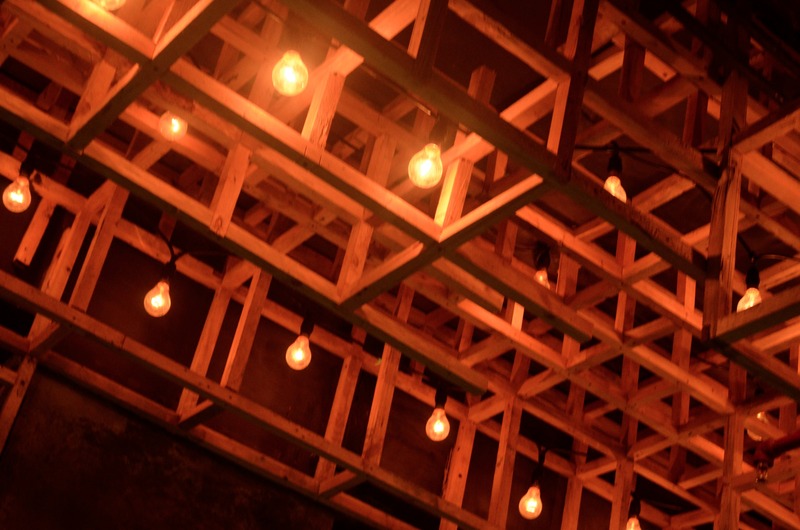 With classic yet contemporary interiors, wooden structure with suspended retro bulbs, exposed brick walls, plush lounge area, Bóveda has the ideal setting for a memorable night out. Not restricting your night within the constraints of walls, it jazzes up your dine out with an open air area where you can revel in the crisp evening air. The colour almost instantly catches your eyes with a classy blend of greys and browns. The crowds hadn’t gathered as we were unusually early for a Friday night. But once we got onto the drinks menu we realized why this place was different from the others. The range was vast and it’s cocktails section made a special mark. 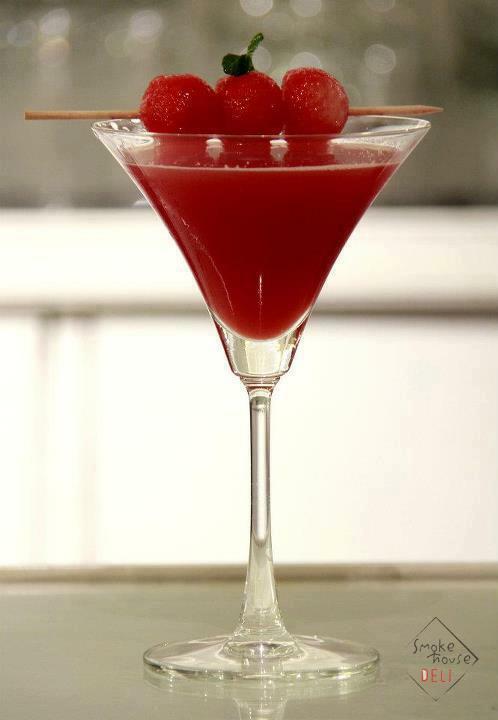 With refreshing and innovative blends on the cards we went for 3 different cocktails and all were more than up to the mark with the watermelon burst being the icing on the cake. A munch or two always goes down well with drinks and we decided to pick a prawn and a mushroom starter. Both were delectable and great on the taste buds. Once in the mouth they had a burst of flavours that were both new and interesting. A mini pepperoni pizza that followed was a perfect choice along with the Patatas Bravas. The sign off was a chocolate mini pastry which was gooey, nutty and yes, very chocolaty.The staff was attentive and pleasant. Most importantly, they knew their dishes and drinks well and made the correct suggestions.The overall food and drink experience was rather rewarding. The pricing was just right and the variety and quality meant that this place would have me coming here again for a bite and a gulp. 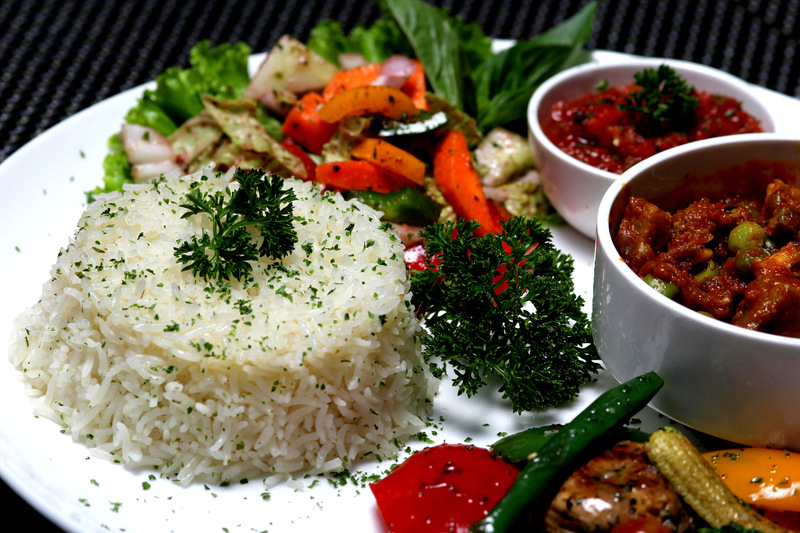 Japanese food seems to be the trend, not just in India but around the world. I for one love Japanese food and have already reviewed a Japanese restaurant before and will be reviewing another soon and with pleasure. Now, the question stands, can a non-Japanese cuisine lover be converted? 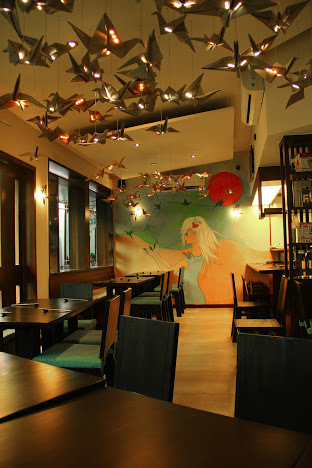 We sent Writer and Blogger Sohini Datta a self proclaimed Japanese cuisine hater, to review the new Japanese establishment Aoi in Bandra Mumbai. Her verdict- well read more to find out. Not everyone likes every kind of cuisine. Japanese like that is my least favourite. Well second last to be more exact, ranking just above the ugly and vicious world of boiled vegetables. Therefore, when my first review was for a Japanese restaurant, I thought it was a cosmic conspiracy. I dragged an American friend for the same; at least someone could explain to me why one should pay to eat raw fish unless he is Robinson Crusoe deserted in an island. But then the cosmic conspiracy unfolded and ten dishes later, Japanese as a cuisine had climbed straight up the ladder of my favourite food list. 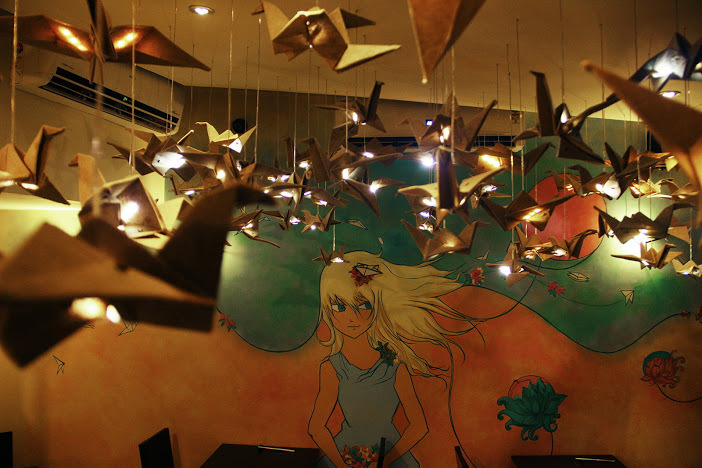 It helped, with hundreds of origami cranes floating right above and filling the ceiling; it was just about enough Japanese for a small eatery in Bandra West. Interestingly, it was a small eatery planned with smart thinking. Open kitchen, bookshelves and enough tables to make it comfortable, made Japanese cuisine a lot closer to the heart. It deconstructed the exoticness of the palate, brought it down to the neighbourhood comfort and yet left us feeling just as fresh and light after the meal at any other fancier restaurant would. This is the result of a clear vision, when you know that you do not need to compromise on anything, just because you want to make it more affordable or you have a smaller space. My American friend was extremely excited, she compared it with the Japanese she eats in New York and she felt it was totally better. I never thought I would fall in love with Salmon tartar, but I did. Aoi successfully converted me. We recommend Salmon Tartar Genryo, Tempura with Japanese mayo vegetables, Beef Yakitori and almost everything on the Sushi list. The new found love for sushi makes me want to go back there almost every weekend, who said raw fish was not edible? Before I get into reviewing ‘The Food Mill’, at Hauz Khas village, I feel it is imperative that I set the scene on how I was roped into writing this review. I am home on vacation from Barcelona and my sister needed help with a couple of restaurant reviews. Given that I am not being productive enough for my family’s liking I was thrown straight into the deep end. She promised me free lunch and duly delivered but more importantly gave me a chance to write about a few of my favourite things – Food and Alcohol. Now as I have been away for a couple of years and ever since I have come back to Delhi it has been impossible to avoid the aura that Hauz Khas Village carries over Delhi folk. 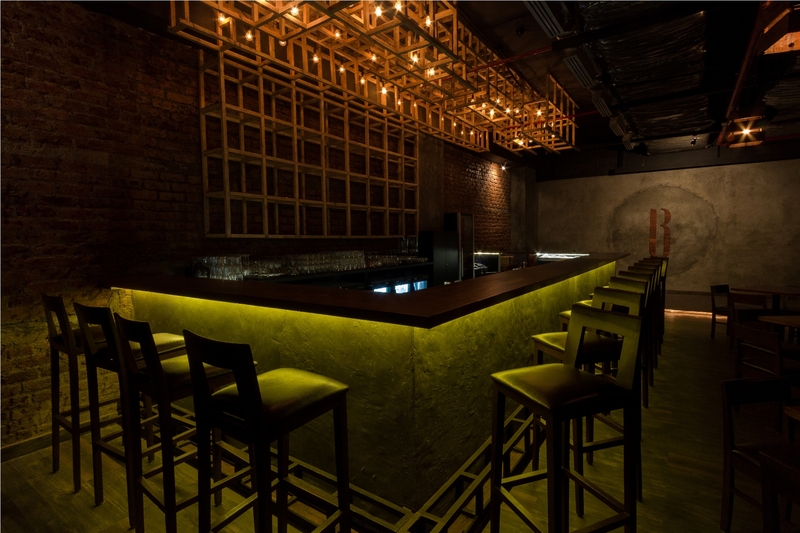 Personally I think Hauz Khas has gone into overkill mode and it has lost the charm it used to have. There are too many places over there and the area seems to be more quantity than quality.So when making my way upstairs to the restaurant I clearly used an incorrect staircase and on asking people was directed towards a door that looked nothing like a restaurant. The gentleman standing at the door confirmed this was the food mill and assumed I am there for a meeting. And so for my first ever restaurant review I walked in through the back door, tip-toed across the kitchen and entered from behind the bar. For a moment there I felt like Henry Hill from GoodFellas. For the curious readers the kitchen was extremely clean however if you have studied in DU, ‘clean kitchen’ takes on a whole new meaning but this was a pleasant sight. 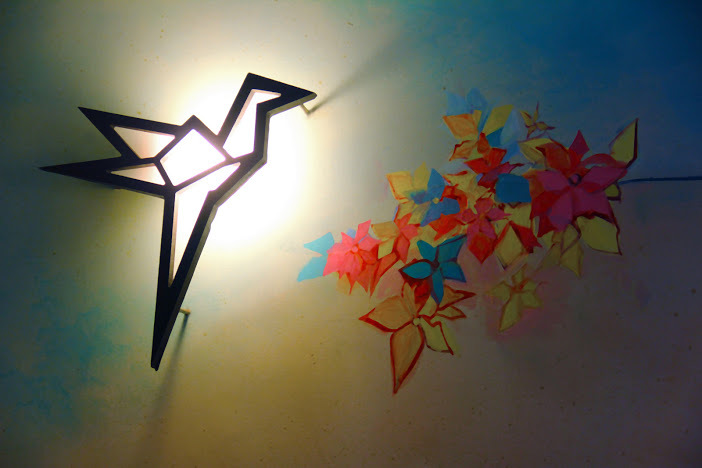 The restaurant was well-lit, decently sized and had a comfortable vibe about it. I have to be honest that when my sister mentioned a place for review I did not think of a place like this-She is accustomed to a rather higher standard of living and so I always imagine places where even if I wore a tuxedo I would feel underdressed and out-of-place. You know the kind of fancy places Delhi loves to visit just to be seen, no matter the quality of food or service. So it would be an understatement to say that I was pleasantly surprised by The Food Mill as it looked like one of the most easy, chilled out places I have seen in a while. I mean at first glance the perfect place for college students and young professionals alike. I took a seat on the veranda and ordered my beer whilst I waited for my sister to show me the ropes of restaurant review. The menu was one of the best menus I have seen for a while, maybe I was happy that the waiter said one of the greatest sentences to Delhi folk of my kind, “Sir, we have kingfisher on tap and its happy hour”. When we as customers enter restaurants we look at a few things namely price, variety of food, ambience, and then you get straight into the food. The menu had a list of items that can only be described as comfort food we love.I ordered a portion of Pan-fried Pork with my beer and as the menu suggested it to be spicy, they didn’t disappoint. The dish was spicy enough to be considered Indian but not too spicy to ruin your beer. The only disappointment about the dish was the cut of pork that entailed too much fat, besides that they gave pita bread on the side which was a great touch. Post that, the more I read into the menu the more I felt that this place would be perfect for college students to come for lunch or for professionals to grab an after work drink. Pan-fried Prawn – the star of the show, well-cooked and amazing sautéed prawns. All in all it was a great experience, I would definitely return maybe not for an entire meal but some appetizers, beers and conversation with my friends. then put blanched pasta ,toss in the pan ,lastly add parmason cheese and mix it well. garnis it with some cherry tomato, basil leaves,& little parmason on the top along with two pieces of garlic bread. with a lid and leave it for 2 minutes. powder, fresh cream and lemon juice. Cover the lid and cook till the chicken is tender. Half a cup of water can be added if more gravy is required. and sautee vegetables.Serve with some boiled rice. 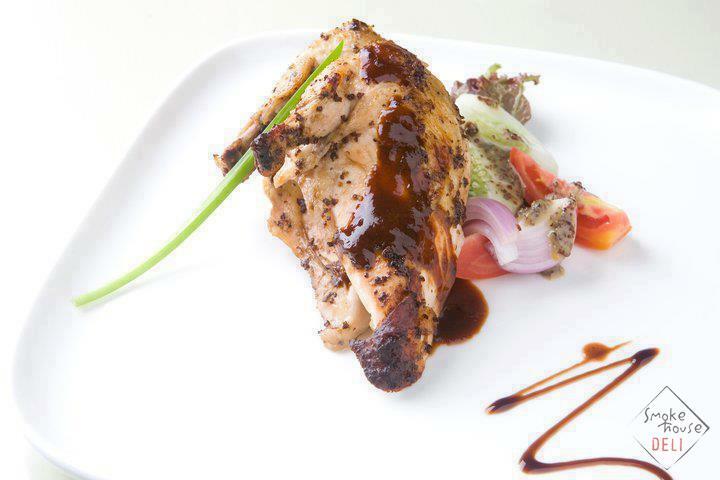 Khan Market finally gets its own Smoke House Deli. Seeped in history, Khan market is the perfect location for the latest Smoke House Deli, the narrow by lanes with shops on both sides are a part of Delhi’s cultural heritage and definitely one of the best markets left in Delhi with the uprising of the mall culture. 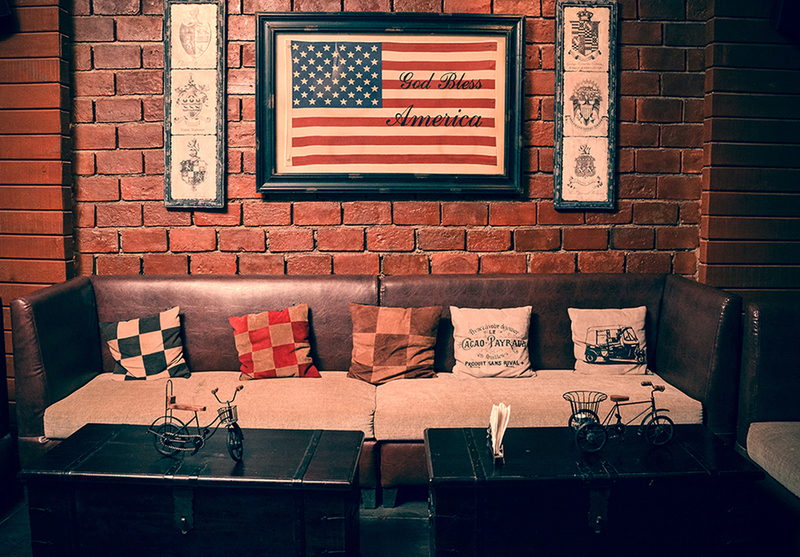 Smoke House Delhi Khan Market takes you down a trip of nostalgia with walls that illustratively resurrect The Empire Store and Sovereign Dairies – landmarks that haven’t existed on these streets in decades. 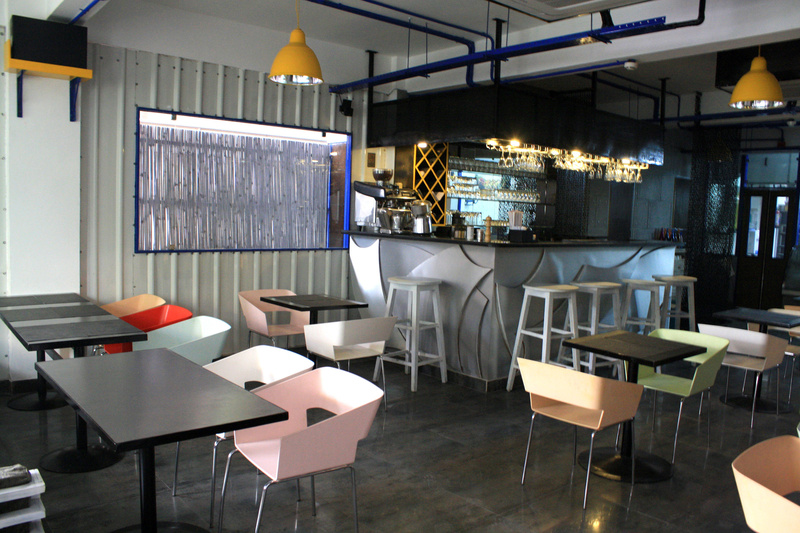 A walk through the café designed by Amith Chhabra of Livin’ Colors Design reveals an interesting mix of 2D and 3D illustrations that cover the walls, to invoke a sense of modern nostalgia. “For instance”, says Kriti Monga, the Designer and typographer who’s beautiful handiwork you see on the walls, “The half illustrated-half real bird bath on the first floor reminds you of childhood trips to Lodhi Gardens, dates on calendars around the cafe are landmark events in Khan Market’s history, and titles in the illustrated bookshelf are a tip of the hat to the locality’s literary giants.” Having spent her early years living in Khan Market, she says, “On a personal note, I get to legitimately draw pictures on walls, in a place I spent a childhood learning to draw in. 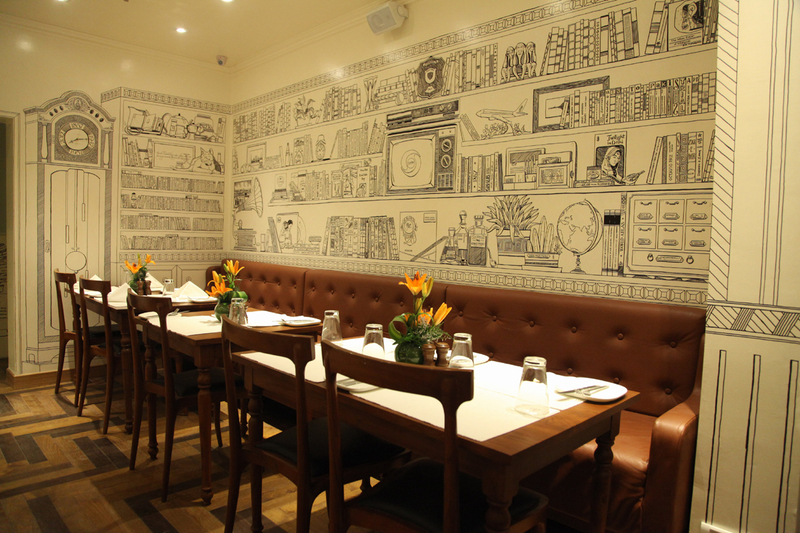 The café is an amalgamation of rich culinary traditions with modern European café fare. “The menu highlights homely, comfort food that please all your senses while retaining gourmet flourishes” says Executive Chef Shamsul Wahid. “Our intent is to give you all-day options with wholesome, healthy as well as hearty fare designed to cater to every mood.”The extensive menu at Smoke House Deli is perfect from breakfast with a variety of pancakes and eggs thru dinner with Wild Mushroom + Artichoke Crepe Gratin, Cambodian Basa + Smoked “Pimento” Puree, Lightly Smoked Lamb Shanks and ½ Roast Chicken. At Smoke house deli you also have options for in-between meals or for the not so hungry. A variety of sandwiches, burgers and pizzas like the Smoked Tomato + Brie Sandwich, the Soy Mix + Curried Vegan Burger, the Smoked Lamb Burger, the Tomato + Buffalo Mozzarella Pizza and the Shrimp + Grilled Chillies Pizza promise to hit the spot. 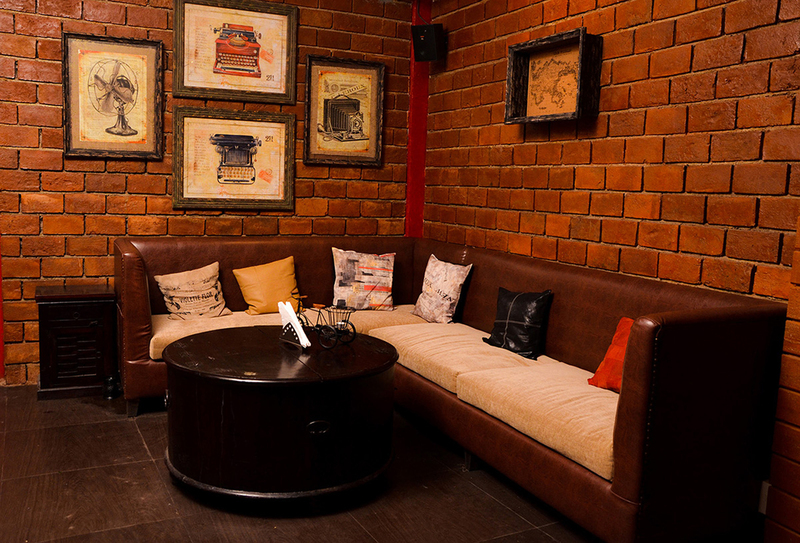 Smoke House Deli Khan Market’s interactive bar is sure to be an instant favourite for those who love a tasty tipple. The extensive cocktail menu features perplexing combinations of fruit, herbs and high-class liquor. Like the other Smoke House Deli properties, the one at Khan Market does not disappoint, neither in terms of food nor decor or ambience. 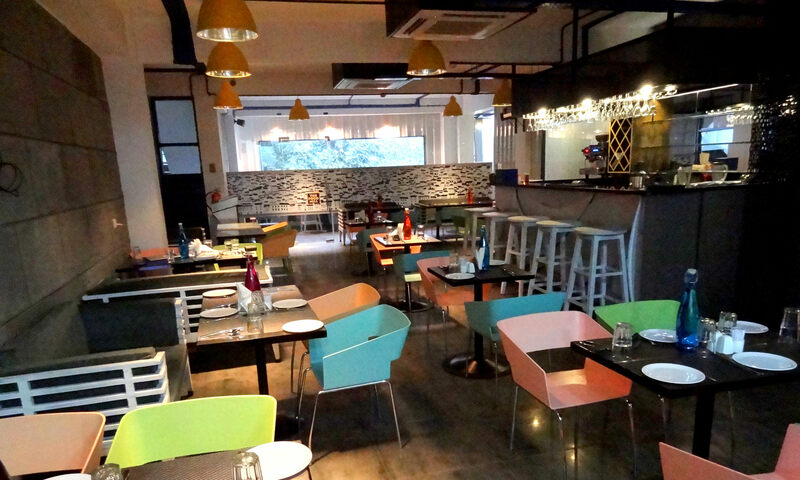 So next time you are at Khan market stop by one of the bylanes at the new Smoke House Deli and enjoy a nice cool watermelon martini in the evening or even a lovely lunch while overlooking the streets of Khan market. Rara Avis Rara Avis is everything French and a bit more. 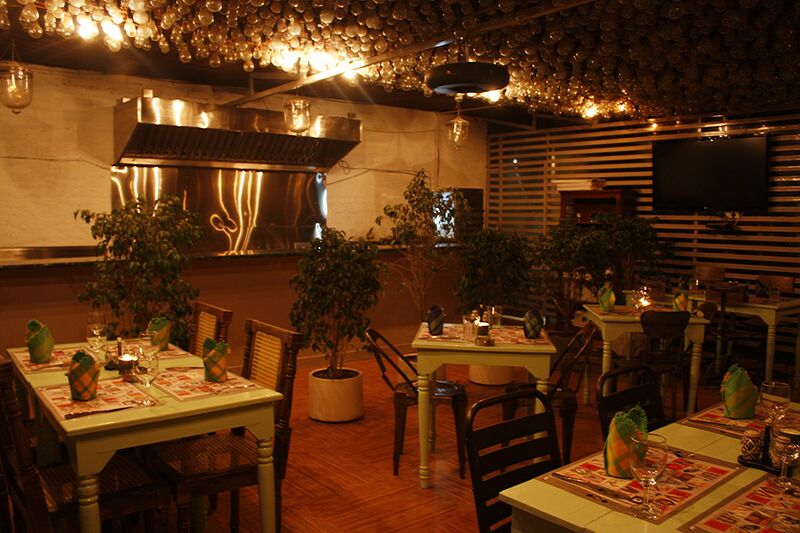 Although, it has a very unassuming staircase entrance, the moment you walk into the restaurant, you get a very cosy and homely feel. Laurent and Jerome its French owners, have gotten together after years of experience in the food business to bring to Delhi diners a chance to enjoy traditional French food. 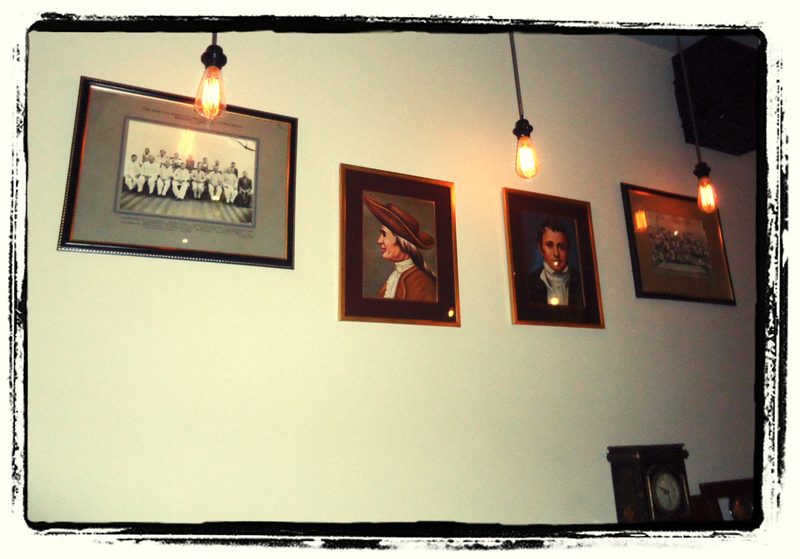 The place spells vintage-adorned by interesting curios collected by owners during their many travels across Europe. 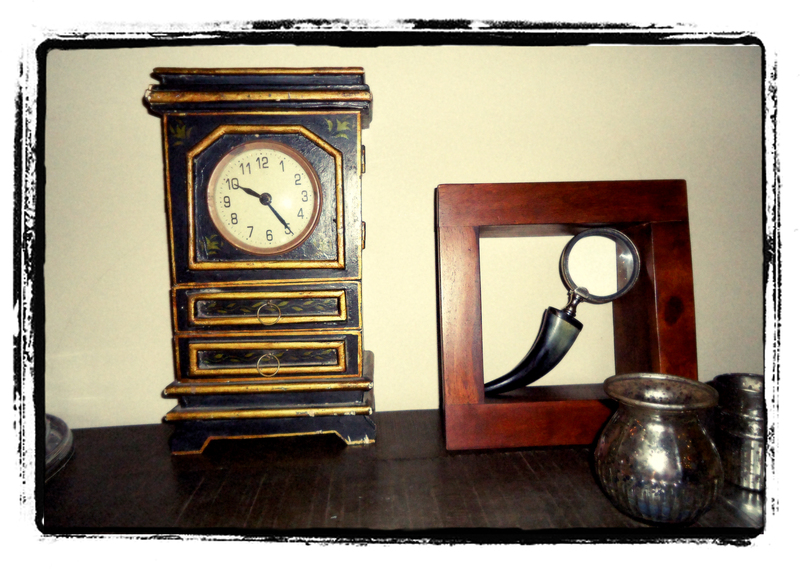 Even the furniture is brought back from France to give the place a real old-world touch. For me personally, the ambience of the restaurant can make or break the mood. Set over two levels, the top is a beautiful bistro like terrace with garden chairs and a live grill, perfect for a romantic candle-lit date or for just catching up with your pals. When one thinks of French food, you visualize a big plate with a small portion of an immensely intricately presented dish. Rara Avis is not about that charade. Like Jerome says, they want to bring traditional and superior quality French cuisine to Delhi just the way it would be made in a large family home back in France. I think this whole idea is very romantic. 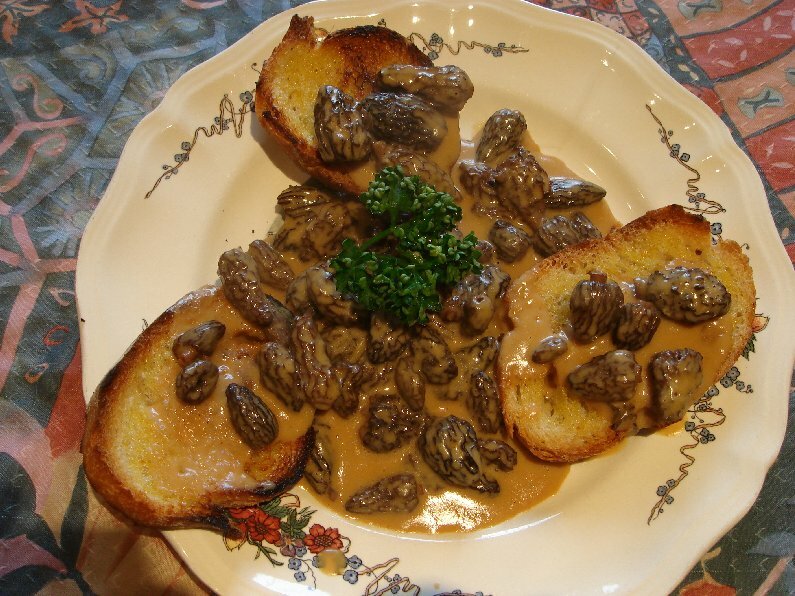 Take for instance my starter Croutes Aux Morilles; it’s a baked dish with a beautiful combination of warm morels mushrooms, red wine and cheese over puff pastry. Led by a rich creamy taste, it has just the right aftertaste of these mushrooms, which are found in Kashmir. The morels are abundant in April-May in the forest of Franche-Comté in France. 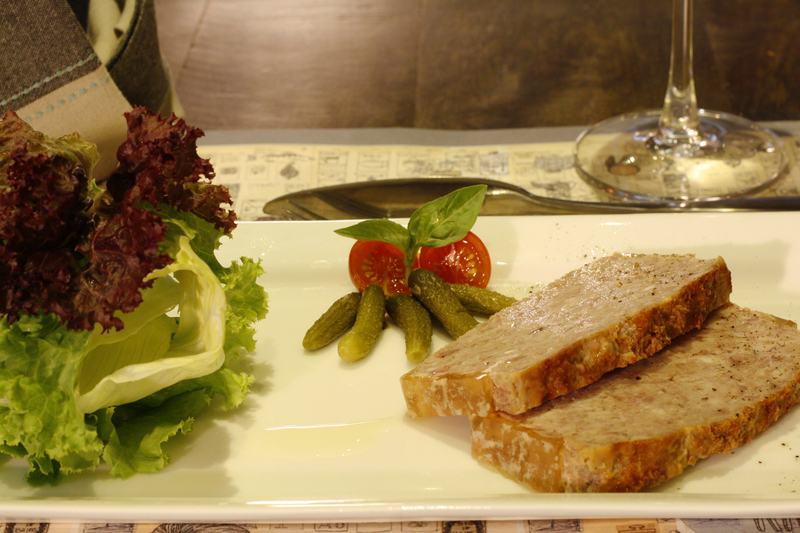 For the meat lovers, I highly recommend Terrine de Jerome which is a Rabbit meat Pâté which you can enjoy best with a glass of red wine. For the main course, we tried Tartiflette and Steak Tartare. While the former is a Potato and melted reblochon kueche, the latter does well to satisfy beef lovers. We rounded our French food journey with a Café Gourmand, which gives you the choice of Espresso or Cappuccino with four mini desserts, perfect for those who want a bit of everything. 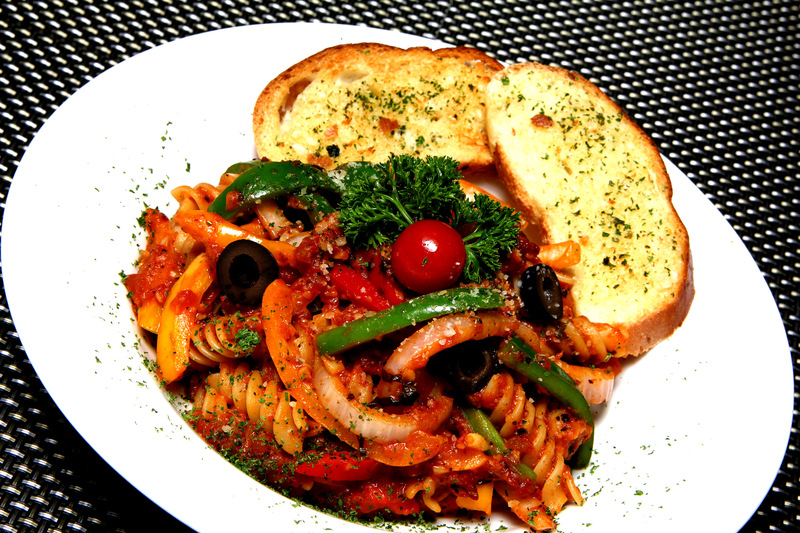 I must say that the menu is highly exhaustive giving you ample choice for a hearty meal. It covers all that you can have if you were to stay in France for couple of weeks. What’s really unique about Rara is that both Jerome and Laurent engage with the diners in a real homely fashion. And Jerome is always running back and forth from the kitchen ensuring that your French food experience is nothing but pure bliss. I must say that Rara Avis lives up to its name, bringing something unique to lovers of good food. It’s truly superb!